Situated in a renovated warehouse in Shanghai, URBN Hotel is China's first carbon neutral hotel. The beautiful space showcases a variety of recycled materials (like suitcases!) and other locally sourced materials in its design and decoration. Thanks to its strong focus on energy efficiency, carbon neutrality, and environmental education for employees and guests, the hotel has since garnered a number of travel awards -- and it plans on lowering its environmental impact even further with additional sustainable strategies like solar power and grey water recycling. 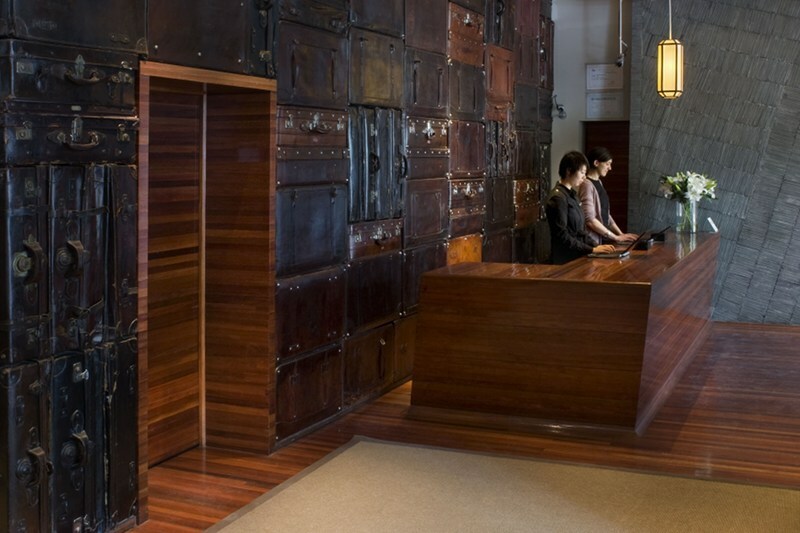 The boutique hotel was designed by A00 Architecture and is set within a renovated warehouse in the heart of Shanghai. 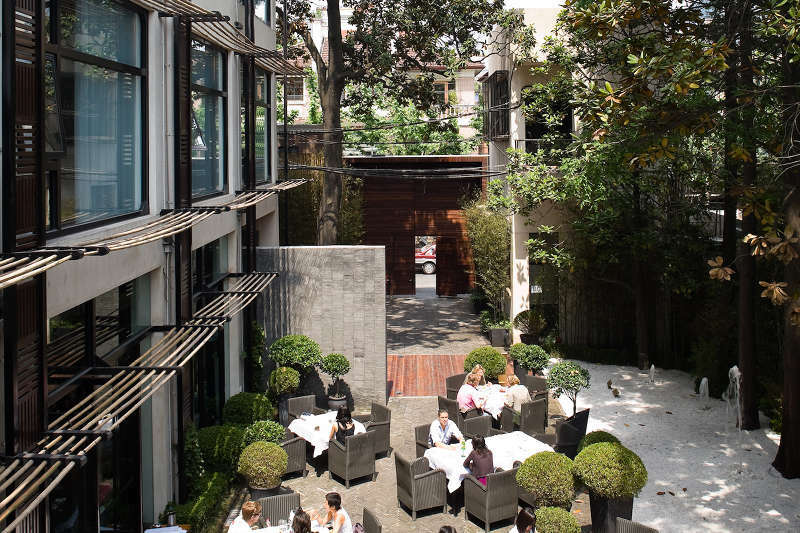 Set back from the street and surrounded by a high wall and gate, the hotel features a private courtyard and small gardens surrounding the hotel. A rooftop patio and garden provides views of the city, while contemporary guest rooms and conference areas have views of bamboo garden scenes. Old suitcases, locally-sourced materials, and other recycled materials are used to decorate the lobby and other public spaces. The hotel utilizes solar passive design and features bamboo shades on the south-facing windows. Reclaimed wood from Shanghai is used for flooring, and old bricks from the city are used in the building as well. Additionally the hotel makes use of an energy-efficient HVAC system, low-VOC paints, energy-efficient lighting, and environmentally-safe cleaning products. The hotel has been carbon neutral since it opened in 2007, and since then it has reduced its energy use even further through employee and guest education. URBN Hotel buys carbon offsets through South Pole and provides their guests the opportunity to offset their flights to Shanghai as well, thus reducing the impact of their travel. Additionally the hotel offers an unusual 6 square meters of green space per guest. The URBN hotel chain has announced plans to open another hotel in Pudong, and it pledges to make this hotel even more sustainable than the last. So far plans for the new hotel include improved energy efficiency, water recycling and filtration, carbon neutrality, and LEED as well as China Green Star certifications. URBN Hotel Pudong is set to open the Spring of 2012. The boutique hotel has 23 rooms and 2 penthouses and it is located in the heart of Shanghai close to shopping and business. The hotel has been carbon neutral since it opened in 2007. It employs energy efficient design, solar passive design and lots of recycled materials. Bamboo poles were used to create shade devices on the south facing windows. The hotel, which is located in a renovated warehouse, is set back from the street behind a large reclaimed wood gate. The gate creates a secluded courtyard and a sense of privacy for guests. On the roof a patio and gardens improve the atmosphere and views of the surrounding city. The hotel also offers an unusual 6 square meters of green space per guest. The hotel used recycled materials from the original warehouse, old suitcases, and other reused items for decoration as well as local materials. URBN Hotel buys carbon offsets for the hotel through South Pole and offers its guests offsets for their flights. The renovation and hotel was designed by China-based A00 Architecture. Reclaimed wood from Shanghai is used for flooring and old bricks from the city are used in the building as well. 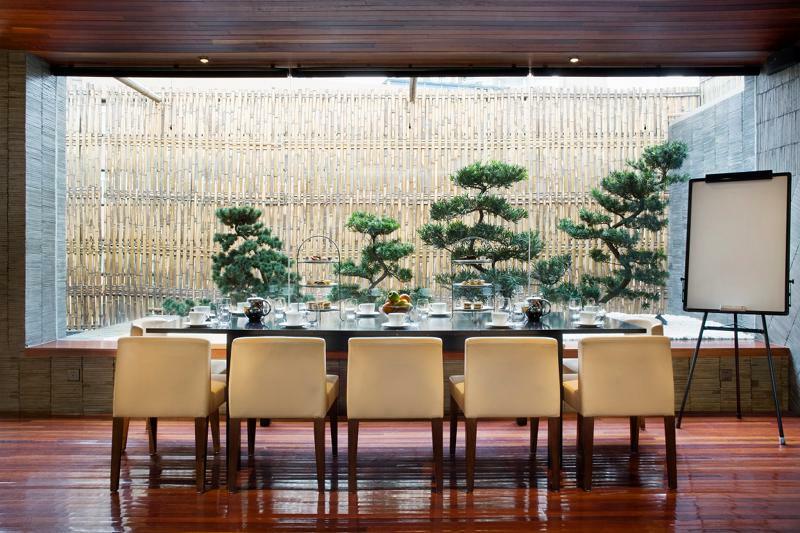 Contemporary guest rooms and conference rooms have views of bamboo-walled garden scenes. The URBN hotel chain has announced plans to open another hotel in Pudong, and it pledges to make this hotel even more sustainable than the last. So far plans for the new hotel include improved energy efficiency, water recycling and filtration, carbon neutrality, and LEED as well as China Green Star certifications. URBN Hotel Pudong is set to open the Spring of 2012.